Now that spring has arrived, temperatures are starting to rise in New Orleans. And that means the transition from heating our homes to cooling our homes is right around the corner. No matter what method you use to cool your home during the warm spring and summer months (central air conditioning, window units, or fans and dehumidifiers), each spring you cross your fingers that your approach still works. If not, you might be calling an expert for a tune-up, or in extreme circumstances, you might need a complete overhaul. Just like an AC system that has probably been dormant for many months of the year, a body that hasn’t been physically engaged on a regular basis may have trouble getting started again. And yet, this time of year, the warm temps draw many people to city and suburban streets, tracks and trails, ready to take that first run of the season. A good percentage of these spring runners haven’t kept up their strides throughout the winter. It should come as no surprise that a 4-mile run for a previously inactive person is going to stir up a few aches and pains. Especially as we age, our ability to move undergoes changes. But whether we’re talking about a college student or a retiree, returning to an activity without proper planning is a recipe for disaster. That’s where physical therapy comes in. Physical therapists are trained to treat injuries and ease the pain, but they can also help their patients prevent injuries and safely prepare to participate in new activities. Think of physical therapists as “movement consultants” who can ensure that your body is physically ready to tackle a new challenge—or resume a favorite leisure activity. Here’s another example to illustrate what we’re talking about: Let’s say that you play in an adult soccer league and you’re preparing to play in your first game of the season in a few weeks. You probably hung up your cleats when the last season ended months ago, but expect to pick up just where you left off. But it’s simply too much to ask for your 2019 debut on the field to be on the same level as the last game of the previous season when you likely had reached peak performance. This is a good time for you to let Baudry PT step in and help you shake off the rust. We can customize an exercise plan to help you slowly return to sport and avoid an injury that could sideline you for the whole season. Or like cleaning the filters before firing up your air conditioner for the first time this year, the rehab expert can help to ensure that your body is prepared to return to its former activity level following a hiatus. Let us get you back in the game. Call 504.841.0150 to book your appointment today! Sitting at a desk for long periods of time has been labeled the “quiet killer”, worse than smoking these days. As a result, standing desks have become extremely popular to combat the effects of sitting. But are standing desks really the solution? First, we need to determine what is really going on with our bodies when we sit to really understand. Our bodies will adapt to almost any situation. If you sit all day long, your body adapts to your position. Your posture begins to round, then the shoulders round and then the chest tightens due to the lack of movement. The body adapts by limiting range of motion and tightening muscles that are shortened regularly. You lose strength in the muscles and can cause tissue damage. In the end, you experience tension in the back and neck, ultimately leading to pain. While sitting can be the cause of common neck, shoulder, and low back pain, you should remember the issue is really a lack of movement. So are Standing Desks the solution? The answer is yes and no. It’s not the only solution, but it can help many desk-bound workers alleviate low back and neck pain. While standing will help with a lot of issues (poor posture, tissue damage, tight quads/hip flexors), you can’t switch to a standing desk and expect your pain to go away. Your body will adapt, but you should know that standing 8+ hours per day leads to its own set of problems, specifically with feet, calves, legs, and back. The ideal solution is a combination of standing and sitting, as well as getting on a regular exercise program. Simply put, you need to move more! Baudry Therapy Center does suggest standing desks, but there are some things to consider before purchasing one. You’ll want to buy one that offers flexible height adjustment so you can alternate between periods of sitting and standing. 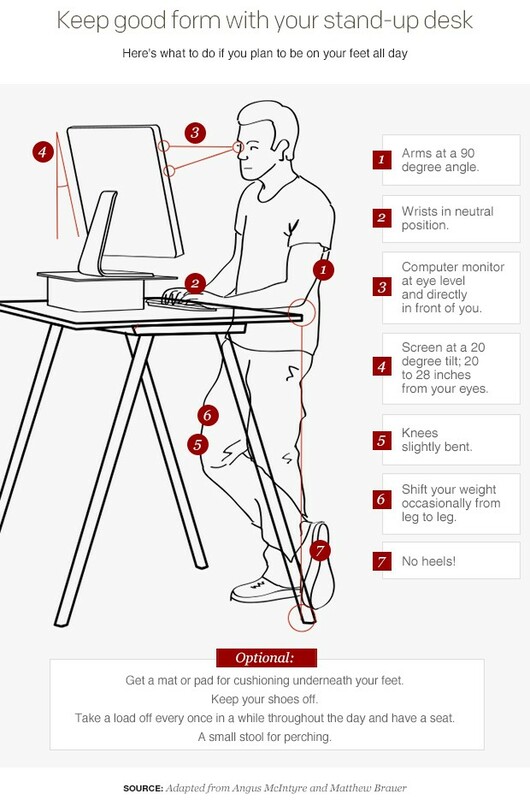 Once your desk arrives and you’re ready to set it up, you should consider some basic ergonomics. When standing, your desktop should be roughly at the level of your elbows. Your desk surface should be clean and clear of clutter. If you read forms or papers frequently, you might look for a tool which would hold the paper up, next to your computer screen, so you don’t have to look down at it repeatedly. Your monitor should be set directly in front of you. The top of the monitor should be at your brow level. You may also consider an anti-fatigue mat, which offers an unstable surface that keep the leg constantly in motion. This constant motion goes practically unnoticed and allows us to stand longer with less detrimental effects. While using the phone keep your neck in an upright position. Set an alarm for every hour to remind yourself to move around. This could be a few squats, a trip to the water cooler or a quick walk around the block. Have a set of reliable stretches/movements that you use throughout the day as needed to get relief. 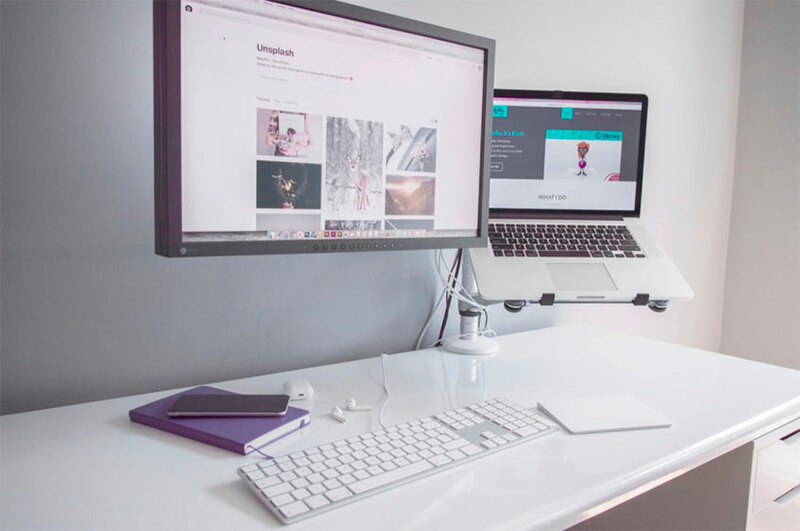 At the end of the day, a standing desk can certainly help your neck, back, and shoulder pain, but to truly alleviate it you need to move more! If you are experiencing pain and want to get a jump-start, call Baudry Therapy Center today. We can help you with one simple consultation. If a standing desk is just not for you, click here for 4 Tips on how to help your back and neck pain while sitting.